I found a new 20GB mobile bundle. My mobile deal with EE is out of contract. I took a look expecting to be able to get a much better deal than one year ago. Pricing didn’t seem radically different to a year ago. I was paying £18.50 for unlimited calls and texts and 2GB of data. Any offers seemed to only last for the first three months. So I looked around. 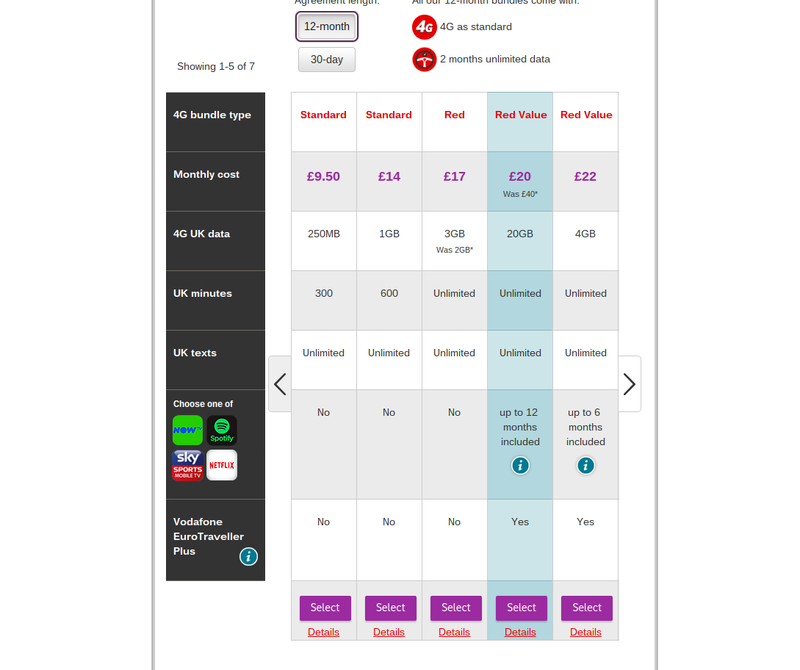 Vodafone had a deal for 20GB at £20 in the first year, reverting to £40 thereafter. With Voday you could also use your bundle in Europe for £3 a day. It’s the data I’m after. EE offer £2.50 for calls and texts in Europe but they make their money on the roaming data, assuming you use it. I don’t. I trooped downtown into the Vodafone shop and signed up. The deal also gave me Sky Sports Mobile. Sorted. Last night, from the comfort of the settee I called EE to ask for a PAC code. The EE guy matched Vodafone’s pricing and threw in free calls and texts within the EU. I said I needed some time to think about it and when I finished the call revisited the Vodafone package. The deal breaker was the Sky Sports. I downloaded the app and set the account up. Blow me down it didn’t work. I tried it number of times and eventually called Voda to sort it out. To cut a long story short the Sky Sports app doesn’t appear to be supported on my Oneplus 2. How does that work? I’ll have to make sure I look at my contract options in 11 months time but that is a mere calendar entry. Now the advent of a 20GB mobile bundle does change things. I didn’t often get anywhere near my old 2GB limit but there again my mobile usage habits were tailored to the package. Photo and video uploads in particular were restricted to when I was in WiFi coverage. I have removed this restriction and it will be interesting to see how this affects cellular data usage. I also used to switch Sat Nav on just for the moments that I needed it as this was also a heavy consumer of data. At least Google Maps was. I’d started using Waze instead which seems to be much lighter on data. The other consideration of course is battery usage. Hitting 4G hard will inevitably use up the battery before I want it using up. I’ll report back. As a footnote to this post, I was discussing the Oneplus 2 with the very pleasant and efficient Sophie in the Vodafone shop and remarked that the major downside was the fact that the screen seemed to scratch easily. Glancing at the phone I then realised that the original plastic screen protector was still on. Doh! For the derogatory comments on their screen in a previous post I offer Oneplus my unreserved apologies. Sorry.